The Maritime Continent is a region of intense rainfall characterised by a strong diurnal cycle. 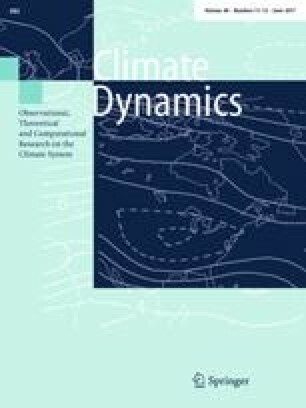 This study investigates the sensitivity of rainfall characteristics to resolution in a coupled regional climate model configuration, in particular focusing on processes that modulate the diurnal cycle. Model biases are resolution dependent. Increasing resolution from 3/4° to 1/4° improves the mean state sea surface temperature and precipitation biases. However, at higher resolutions (1/12°) rainfall becomes too strong in most areas. Daily maximum rainfall is simulated about 2–4 h earlier than in observations over both the land and the ocean, with only small improvements over high topography at higher resolution. We develop a technique to examine cross-coastal processes associated with the rainfall diurnal cycle along all coastlines. This is used to investigate the sensitivity of the diurnal cycle to resolution and to the direction of the prevailing wind. During offshore prevailing winds, most land rainfall is confined near the coastline and associated with a shallow land-sea breeze circulation at all resolution (though rainfall partly develops directly inland at 1/12°). During onshore prevailing winds, rainfall propagates from the coastline to the island interior at 1/4° and 1/12°, whereas it appears directly over the island interior at 3/4°, and this is associated with a deep convective cell across the coastline for all resolutions. Oceanic rainfall propagates far offshore during offshore prevailing winds at all resolutions, whereas it tends to remain confined near the coastline under onshore prevailing winds condition, particularly at higher resolution. The online version of this article (doi: 10.1007/s00382-016-3317-y) contains supplementary material, which is available to authorized users. This work was supported by the Australian Research Council Centre of Excellence for Climate System Science (CE110001028) and the Commonwealth Scientific and Industrial Research Organisation (CSIRO) in Australia. The collaboration with S.M. was supported by the Visiting Researcher Fellowship of the UNSW faculty of science and by the project PULSATION ANR-11-MONU-0010 of the French National Research Agency (ANR). WRF was provided by the University Corporation for Atmospheric Research (http://www2.mmm.ucar.edu/wrf/users/download/get_source.htm). All the simulations were performed on the Australian National Computational Infrastructure (NCI).